Now you can lift and store your fully assembled scooter in the rear of your van or minivan the easy way. 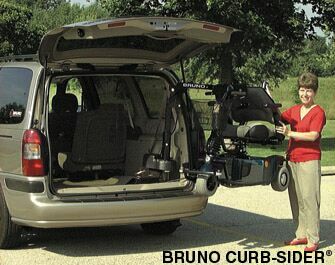 Bruno's Curb-Sider can end the struggle of trying to manually lift and store a scooter in your van or minivan. The Bruno Curb-Sider was designed to fit most types of vans, minivans, sport utility vehicles and pickups with caps. Plus, the Curb-Sider can be adapted for use with some types of power wheelchairs, increasing its versatility. The Curb-Sider lift is electrically powered from the vehicle's battery. Simply press a button on the hand-held controller, and the Curb-Sider raises and lowers any scooter weighing up to 200 lbs., effortlessly. Bruno's Curb-Sider provides a unique 180 degree powered rotation, which makes it possible to raise, lower and rotate a fully assembled scooter on the curb, at the side of your vehicle, or directly behind it. The Curb-Sider's rotation feature allows it to stow scooters in vehicles with tailgates. The lift arm can be folded vertically when not in use and installation does not require any structural modifications to your vehicle. Expert installation and complete after-sale service is provided by Bruno's nationwide and international network of dealers.